This site uses the term “Co-infection” to specifically refer to other non-Lyme illnesses that are transmitted by black-legged ticks. Thus, while every co-infection is also a tick-borne disease, not all tick-borne diseases are co-infections. Formerly known as human granulocytic ehrlichiosis, anaplasmosis (formerly known as human granulocytic anaplasmosis or HGA) is caused by Anaplasma phagacytophilum. Infection is potentially serious with a mortality rate of < 1%. Death, though quite uncommon predominately occurs in the very young and very old. Most cases in the United States occur in the Midwest and Northeast. More severe illness may result if co-infected with Lyme disease. Malaria-like illness caused by a parasite, Babesia microti, B. duncani, B. divergens and others. Babesiosis is a potentially serious infection and can cause death in those who are immunocompromised. Incubation can last weeks to months. May be more severe in patients with co-existing Lyme disease. There have been 6 cases of Borrelia mayonii identified to-date, it is too early to draw conclusions about differences in its symptom pattern compared to Lyme disease. A recently recognized pathogen in the relapsing fever group of Borrelia, this bacterium invades numerous tissues. This bacteria causes a illness similar to Lyme though it is not closely related to the bacteria that causes Lyme disease. HME is a potentially serious co-infection caused by Ehrlichia chaffeensis when transmitted by the Western blacklegged tick. HME has a 2-3% mortality rate. Most cases are located in SE and south-central states. Cases to-date limited to the Upper Midwest. The disease is very similar to anaplasmosis, please refer to that section. 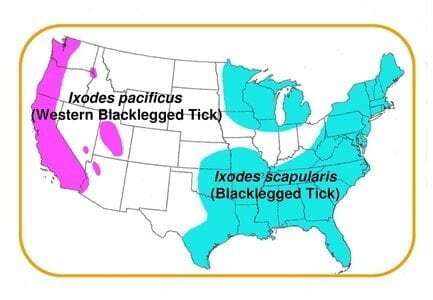 Typically caused by an Ixodes scapularis bite, can also be transmitted by other Ixodes species. More serious symptoms include confusion, tremors, seizures, paralysis and even coma. Death occurs in 10 to 15% of those infected and 50% of survivors have permanent neurologic issues. Supportive treatment only; no specific treatment is available. Caused by several Bartonella species which can be transmitted by flea or louse bite, cat scratch and possibly via ticks. Lab testing: Diagnosis is based on acute and convalescent antibody titers (IFA) and/or positive PCR analysis.